Revision surgery for reconstruction of failed posterior cruciate and multiple-ligament injured (MLI) knees is a difficult problem for knee surgeons. The procedure is required much less commonly than revision anterior cruciate ligament reconstructions. One of the key steps in managing this challenging problem is determining the cause of failure for the original procedure. 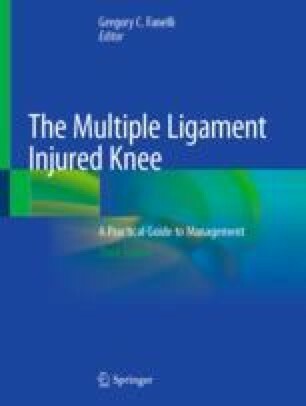 Just as in the case of ACL failures, common causes of failure for PCL and MLI reconstructions can be divided into three general categories: iatrogenic, biologic, and traumatic. Often unrecognized combined instability, improper graft technique, and abnormal bony architecture influence the success rate of primary and revision reconstructions. In devising a strategy for revision knee ligament surgery, thorough preoperative planning is essential to success. Surgical treatment strategy for failed PCL and MLI reconstructions is dependent on several key factors. Factors to consider include the following: which structures are to be reconstructed or repaired, preferred reconstruction technique, graft selection, prior tunnel position, and type of graft fixation to be employed. Other important considerations in revision reconstruction are the need for combined osteotomy, the status of the meniscus and articular cartilage, surgeon experience, and a specific postoperative rehabilitation program. The surgeon performing revision knee ligament surgery must also be aware of and prepared to manage the common intraoperative and postoperative complications of these procedures.